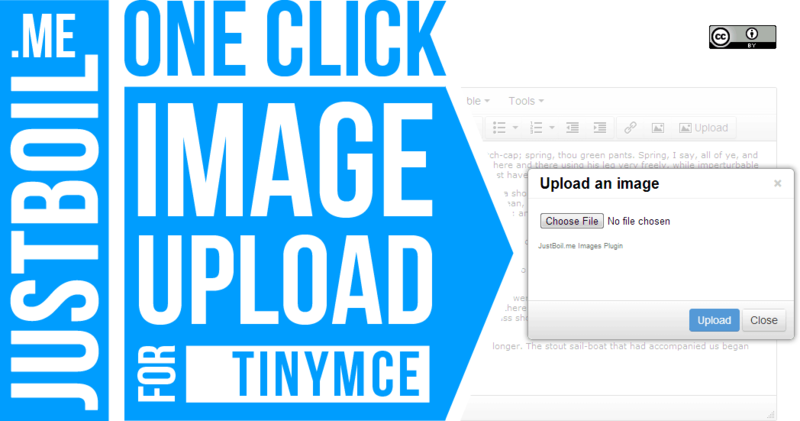 JustBoil.me Images is a simple, elegant image upload plugin for TinyMCE. It is free, opensource and licensed under Creative Commons Attribution 3.0 Unported License. Download @Github Donate Donation gives you the right to remove attribution. Optionally disables uploads of image file formats that are not marked as allowed. Download distribution pack. Unzip it into TinyMCE’s plugins folder. Edit config.php file found in plugins/jbimages. Minimally, you should only specify a target directory for your uploads. Every block of config.php is well-commented, so I think everything should go right. Activate jbimages plugin and add jbimages button in TinyMCE. Don’t forget to set theme:advanced and relative_urls:false. English version only. The l18n api in TinyMCE 4.x had changed, so temporary solution was to hard-code english strings. "insertdatetime media table contextmenu paste jbimages"
In case, the TinyMCE’s folder is not protected with HTTP Authorisation, you should require is_allowed() function to return `TRUE` if user is authorised, `FALSE` - otherwise. is_allowed() is found at plugins/jbimages/is_allowed.php of your TinyMCE installation. UPD 03/2013. Thanks to Niels Harbo, a multimedia designer from Copenhagen, Denmark. Here is a list of common errors. The upload directory does not appear to be valid – By default, JustBoil.me guesses the physical path to your upload directory based on your img_path setting. If you see this error, probably the plugin was not able to guess the right path. The solution is to set the physical path manually ($config['upload_path']). Inserted images are relative to site’s admin page. Usually something like <img src=”../../../images/yourimage.jpg”> instead of <img src=”/images/yourimage.jpg”>. You should set relative_urls:false in your TinyMCE init script (see integration code example above). Please support the project by donating via PayPal. Donating also gives you a right to remove author’s attribution and plugin name (if you want to, of course).